Half back Gareth Moore says he is relishing the chance to ply his trade behind what he expects to be a dominant Halifax pack in 2016. Moore, a close season recruit from Featherstone, made a solid debut in last weekend’s 52-16 win over Whitehaven, contributing an eye-catching kicking game and scoring a first half try. And the former Batley playmaker, who is back at the Shay six years after a month-long loan stint as a teenager, highlighted the forward juggernaut assembled by coach Richard Marshall as a major factor in his successful start. Marshall effectively deployed six props against Haven, using Jacob Fairbank and Adam Robinson at loose forward, to dominate up front and give Moore and captain Scott Murrell the platform to control the game. “We had quite a small pack at Featherstone last year and this year, playing behind the guys we have here, makes my job a lot easier,” admitted Moore, who missed both the club’s pre-season games after an incident over Christmas left him with facial injuries. “You’re backing up play a lot more, working off quick play the balls, and it just makes everything 10 times easier. “Me and Scott have been training together, but it was a good start and as he said to me afterwards, that combination is only going to get better the more we play together. “I knew I had to prove something out there and I think I did that. “There are still a lot of things to work on but I thought I played reasonably well. “I think everyone in the team is in the same position to be honest; there are two or three players pushing for every position and it’s healthy for the team. 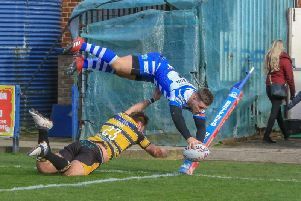 Fax now head to Sheffield’s new home at Hallam University’s sports campus on Friday night (8.0) for their first meeting with one of the Championship’s four full time sides. “The teams who have gone full time and are training every day, it gives them an advantage, no matter who is in their side,” said Moore. “They get that extra preparation and that extra recovery. “We do three days, they’re in every day; you get more time with the ball and more time to work on those combinations.